Get up to 45% off select prepaid rates nationwide. Booking and pick-up between 9/8/15 and 11/15/15. Expires on 11/15/2015. Save up to 30% off any rental & up to 50% off select weekend rentals. 30% off offer is Valid on all Car Classes and Collections except Dream Cars & 50% off offer is Valid on only Economy through Midsize car classes. Twenty-four hour advance reservations required.Blackout periods may apply. Get up to 20% off the base rate when you Pay Now. No promo code needed. Book by 10/19/18. Young Renter Promotion! Save up to $30 per day when you book for 23 and 24 year old. No underage fee. Earn a $50 hotel gift card when you rent economy through full-size cars. Valid at participating Hertz locations. Receive complimentary premium benefits: SiriusXM, Premium Roadside Service when you Experience a Range Rover Sport + Additional Driver with your Range Rover Sport rental. Book a rental for a chance to win a VIP race weekend in Phoenix for you and 3 friends. Each rental booked and completed between 7/18/15/18 gives you one entry to win. Book & Earn a $50 hotel gift card when you rent a midsize car or larger for 3+ days. 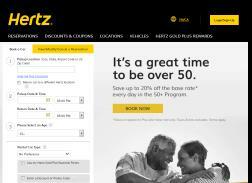 Save up to 20% with Hertz discounts. Save up to 20% on your rentals base rate when you Pay Now. Discount applies to Pay Later base rates when you pay now. Taxes and fees included in final Pay Now rate. Offer is redeemable at participating Hertz airport locations in the US. Valid on all car classes. Get 40% off all car classes. Excluding Dream Cars. Pick-ups through 05/31/2016, at participating airport locations. Blackout periods may apply. Expires on 11/30/2015.